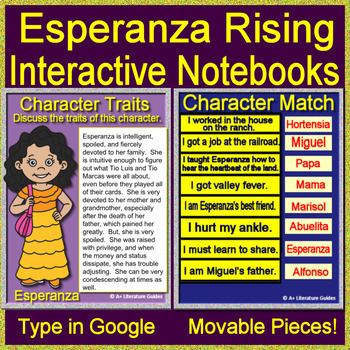 #TpTtech Paperless Resource - Esperanza Rising Novel Study using Google Drive! 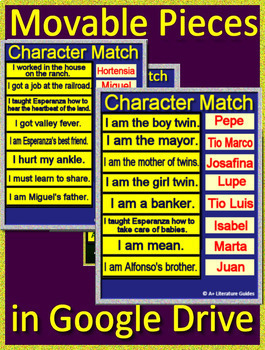 Two Digital Interactive Notebooks are included: Story Elements activities with movable, interactive parts (22 Google slides), and Comprehension Questions that cover the whole novel, all 15 chapters, which prompts students to fill in the text (20 Google docs). All answer keys are included. Great for Google Drive, Google Classroom, Microsoft OneDrive, iPads, or a learning management system. Go paperless! --Teacher Tutorial – includes the access links, how to use them in your classroom, and answer keys. Other digital notebooks include Frindle Interactive Notebooks, Bridge to Terabithia Interactive Notebook, The Watsons Go to Birmingham Interactive Notebook, A Christmas Carol Interactive Notebook, Esperanza Interactive Notebook, The Giver Interactive Notebook, The Call of the Wild Interactive Notebook, Anne Frank Interactive Notebook, The Lion, the Witch and the Wardrobe Interactive Notebook, Freak the Mighty Interactive Notebook, The Best Christmas Pageant Ever Interactive Notebook, The Outsiders Interactive Notebook and A Wrinkle in Time Interactive Notebook. 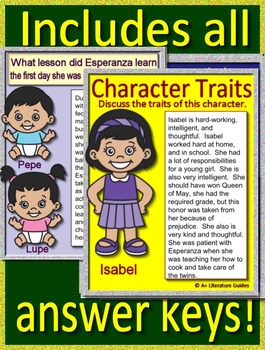 A+ Literature Guides are made by a language arts teacher with 30 years of experience teaching language arts, as well as 14 years of experience writing state and national assessments that align with common core standards.